How Do You Measure Discipleship? How do we measure discipleship? It is relatively easy to measure church attendance, giving, or small group participation, but how do we measure church members becoming more like Christ? The Willow Creek Reveal Study pointed out that church activity doesn’t necessarily lead to fully devoted follower of Christ, but are there activities we can measure to help our congregation grow? Serving in a local church. Church attendance without service does not grow me as a disciple. To grow I have to serve generously with my time, talent and treasure. Praying consistently. This is so obvious that it seems to get overlooked. A growing disciple follows Jesus’ pattern of consistent, heartfelt prayer. Reading the Bible daily. Separate studies by the Willow Creek Association and Lifeway on discipleship came to the same conclusion; the single biggest factor in growing as a disciple is reading the Bible every day. It’s the magic pill of discipleship. Engaging in biblical community. Discipleship throughout the Bible is always in context of community. Being in a small group does not guarantee discipleship, but not being in biblical community prevents it. Actively involved in missional outreach. Biblical disciples engage in Kingdom transformation in their home, their community and their world. Developing other disciples. Jesus final command was very clear, Go make disciples. Every growing disciple of Christ develops other disciples. I’d like to suggest the following tool to help determine the temperature of discipleship in your congregation (and in your own life). I have used the acronym SPREAD to make the six areas easier to remember. Your church attenders may need some additional information to understand how you define each area in your context. Create a simple survey with the following questions. Give the survey and a pen to everyone who attends one weekend, and take time during the service to fill out the survey out together. The first time you take the survey serves as a baseline for discipleship. Use the results to celebrate where the congregation is strong and to focus on helping them grow in areas where they are weak. Choose one area that seems to be weak across the board and focus for the next quarter on growing in that area as a church. Retake the survey every three months for a year to measure progress. Be sure to let me know if you use this tool and how I can make it more effective. Too often in the culture of church we focus on leadership and growth models – we have seminars, books, models, techniques, tools, study guides, celebrities and more. 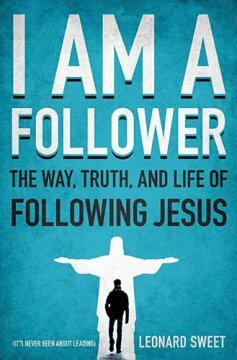 I Am A Follower by Leonard Sweet challenges the church that their priority is on following Jesus. “I Am A Follower” is a new kind of book about leadership paradigms. Its goal is not to establish the five most prominent attributes of a leader nor is it a tutorial on how to become a great leader. Rather, its premise is based on the idea that the best “leaders” point to the true Leader and that we need to recommit ourselves to loving God with all our heart, mind, soul, and strength so that Jesus can live his resurrection way, truth, and life in and through us. To follow Jesus is to be in the right mission—the way: missional living. To follow Jesus is to be in the right relationships—the truth: relational living. To follow Jesus is to be in the right future—the life: incarnational living. This seems to be a natural progression that Jesus proposed: first belonging (way), then believing (truth), then behaving (life). This book, as with all Leonard Sweet books, is deeply challenging, and while I struggled with his over use of semantics, for example, replacing the word “leader” for “first follower”, I wholeheartedly agree with Sweet’s assessment of leadership infatuation within the church and culture. As always, Sweet has a brilliant and artistic way with his words that captivates the reader throughout the pages. More important than his artistic style, the heart of the book is challenging to the core. I would absolutely recommend this book to any person: “leader” and “non-leader” alike. Our primary goal is not to accumulate more followers of our ideas and thoughts (and Sweet certainly does not intend to earn followers of his own); rather, we have been called to follow Christ. Are you ready to leave the mindset of leadership and enter in the relationship of following? If so, “I Am A Follower” is a must-read for you.